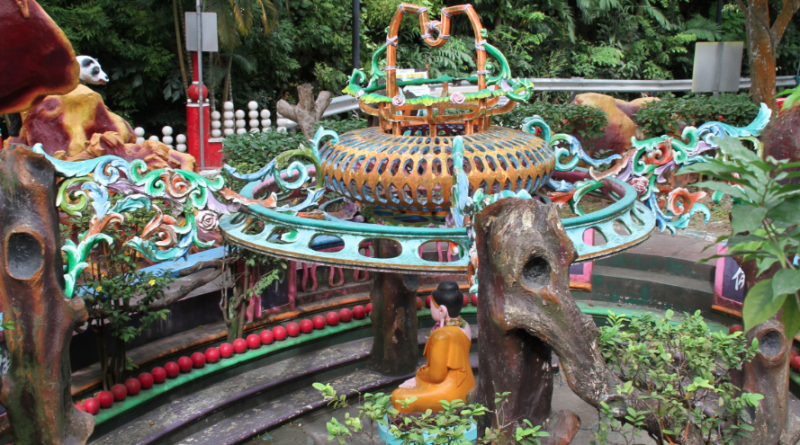 Haw Par Corporation Ltd (Haw Par) has a century-old legacy where its roots are traced back to the 19th century. It started with Aw Boon Haw (the Tiger) and his brother, Aw Boon Par (the Leopard) in the British colonial days. The two brothers had perfected their dad’s recipe of making ointments, which in turn, led to the production of ‘Tiger Balm’. The two founding brothers, Aw Boon Haw and Aw Boon Par, passed away in 1944 and 1954. Subsequently, Aw Cheng Chye, the son of Aw Boon Par, took control over the family’s businesses. In 1969, Haw Par Brothers International Ltd was listed on the Singapore stock exchange. Then, in 1981, Wee Cho Yaw, the man behind United Overseas Bank (UOB), took over control of Haw Par Brothers International Ltd. In 1997, the company was subsequently renamed to Haw Par Corporation Ltd (Haw Par) and has resumed its name till today. 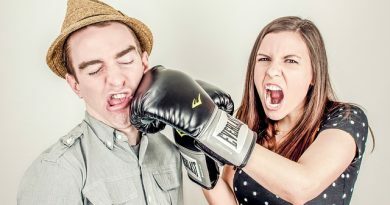 In this article, I’ll share 8 quick things that you need to know about Haw Par before you invest. Haw Par is the owner of the iconic Tiger Balm Brand, which is now a leading and most versatile analgesic brands of the world. Presently, it is being exported to over 100 countries worldwide and is a household brand in many of these nations. The division has reported a CAGR of 11.1% in revenues over the last 10 years. It grown from S$ 70.5 million in 2007 to S$ 201.7 million in 2017. This is directly attributable from a consistent growth in export sales to nations in Asia, particularly over the ASEAN region. Haw Par has increased its investments in United Overseas Bank Ltd (UOB) from 63.9 million shares in 2009 to 73.2 million shares (4.4%) in 2017. Presently, UOB is the third largest financial services group in Southeast Asia that operates over 500 branches worldwide. Haw Par has received bulk of its investment income from UOB. Income from UOB has increased from S$ 38.3 million in 2009 to S$ 50.8 million in 2017. This is in line with continuous growth in its loan portfolio, total income, and shareholders’ earnings during the period. In 2017, Haw Par’s investment in UOB was valued at S$ 1.93 billion. 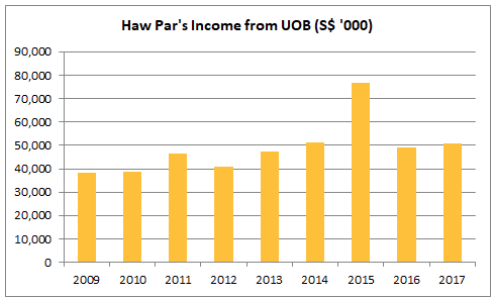 In 2015, UOB has contributed significantly higher income at S$ 76.7 million to Haw Par. The income was inclusive of an one-off gain that arises from a partial disposal of Hua Han Health Industry Holdings Ltd (Hua Han) in 2015. Haw Par is a substantial shareholder of UOL Group Ltd with 72.0 million shares (8.56%) in 2017. UOL is a leading property company listed on the SGX which is involved in property development and investments and hotel operations under Pan Pacific and Parkroyal brands in Singapore. 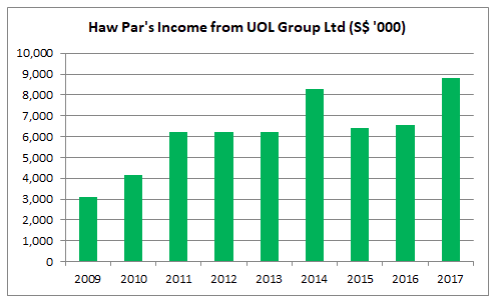 Income from UOL Group Ltd was kept stable around S$ 6 – 7 million a year from 2011 to 2016 as UOL Group Ltd has paid out stable dividends during the period. In 2017, Haw Par’s income from UOL Group Ltd has jumped to S$ 8.8 million. This is because the income was inclusive of United Industrial Corporation Ltd (UIC) which became a subsidiary of UOL Group Ltd in 2017. 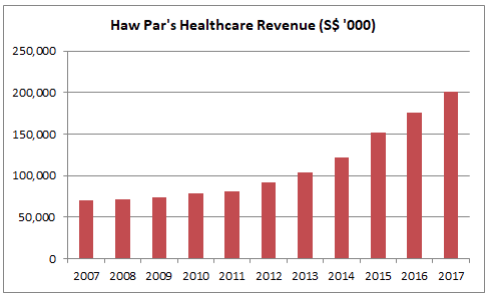 Haw Par has reported consistent growth in revenues over the last 10 years. It is contributed from growing sales of Tiger Balm products across Asia. Profits from 2007 to 2010 had fluctuated wildly due to huge fluctuations in changes of fair value of its investment properties. 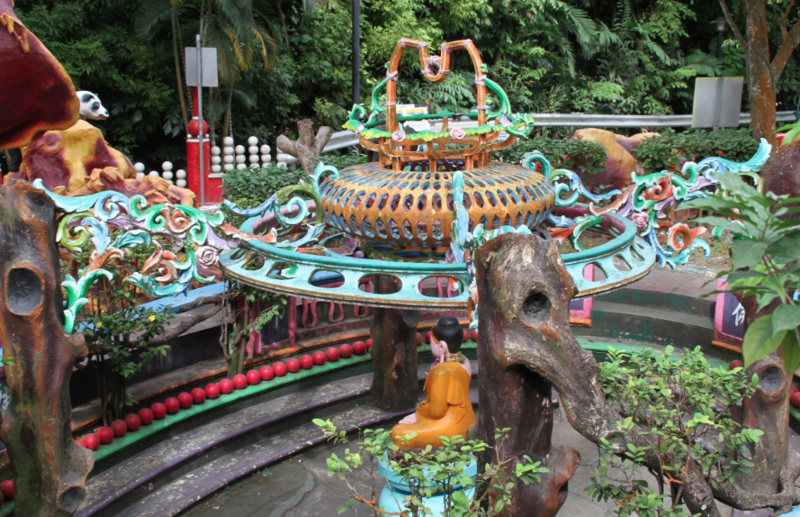 Haw Par increased its earnings from S$ 79.8 million in 2011 to S$ 125.5 million in 2017. The earnings in 2015 were higher due to receiving an one-off gain from the disposal of Hua Han in that financial year. 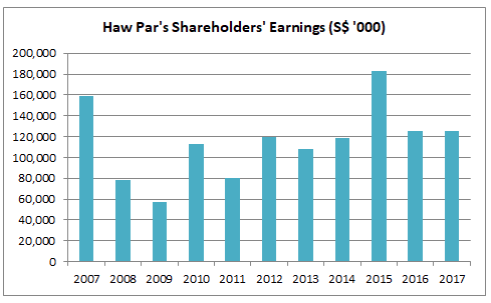 In that 6-year period, Haw Par has a 6-Year Return on Equity (ROE) average of 5.02%. It means, it has made, on average, S$ 5.02 in shareholders’ earnings from every S$ 100.00 in shareholders’ equity from 2011 to 2017. As at 31 December 2017, Haw Par has zero long-term borrowings. Therefore, its gearing ratio works out to be zero. It has increased its cash reserves from S$ 51.7 million in 2007 to S$ 400.5 million in 2017. It has reported total capital adequacy ratio of 18.7% in 2017. Hence, it is well-capitalized to pursue business growth and withstand financial crisis if it happens. In September 2017, UOB has received a license to establish a foreign-owned subsidiary bank in Vietnam. Thus, it is able to deepened its presence in Southeast Asia. In November 2017, UOB has opened a new branch in Kunming. It is the 17th branch in China. This enables UOB to capitalize on China’s Belt & Road Initiatives in the near future. 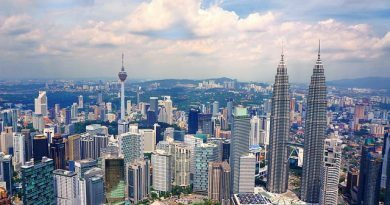 It plans to launch Amber 45 in Q2 2018, Potong Pasir Ave 1 Site in 2H 2018, 92-128 Meyer Road site in 2019 and One Bishopgate Plaza in the United Kingdom in 2018. 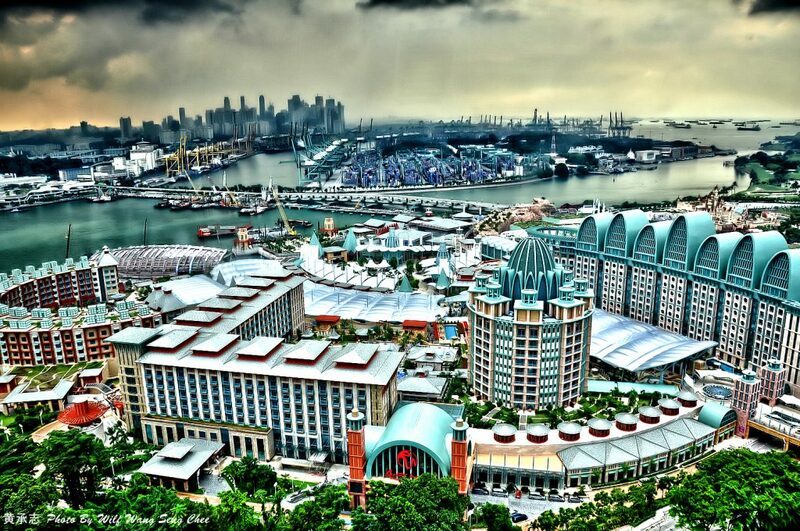 UOL is expected to generate stable income from its portfolio of commercial properties mainly located in Singapore. To name a few, these properties include Novena Square, United Square, Odeon Towers, and OneKM shopping mall. It would also be generating stable income from a portfolio of 30 hotels in the future. As I write, Haw Par is trading at S$ 13.71 a share. In 2017, Haw Par has reported earnings per share (EPS) of 57.1 cents. Hence, its current P/E Ratio works out to be 24.01. It has reported to have S$ 14.68 in net assets a share. Thus, its current P/B Ratio works out to be 0.93. 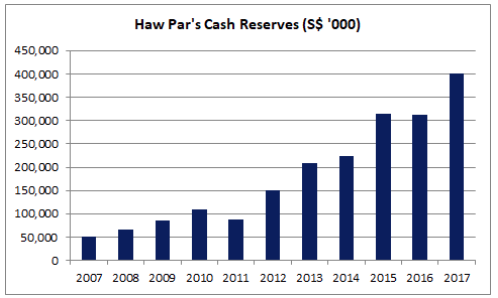 Haw Par has paid out 20.0 cents in ordinary dividends per share (DPS) over the last 5 years. If it is able to maintain DPS at 20.0 cents in 2018, its dividend yield is expected to be 1.46%. Wee Cho Yaw, Wee Ee Cheong, Wee Ee Chao and Wee Ee Lim are major shareholders of Haw Par with their interests in both Wee Investments Private Limited and Supreme Island Corporation. Wee Cho Yaw is appointed as the Chairman while Wee Ee Chao and Wee Ee Lim are appointed as Deputy Chairman and CEO of Haw Par respectively.